DatacomIT welcomes the State Library of Queensland to its long list of ST ViewScan customers. The State Library of Queensland researched and tested all available digital microfilm products on the market and via this process in conjunction with feedback from our existing customers, choose the platinum award winning ST ViewScan III. The State Library of Queensland now join a long list of over 260 satisfied customers throughout Australia and New Zealand that include the State Library in NSW (38 units in total, replacing 10 existing ScanPro machines), the State Library of Tasmania, the State Library of Western Australia and the Northern Territory Library. 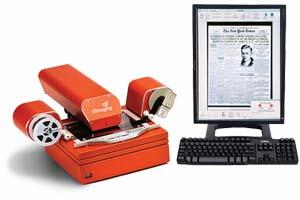 The State Library of Queensland have installed the platinum award winning ST ViewScan III devices into its public access area to enable patrons to view, print and scan to USB, records and information found on the vast collection of microfilm and microfiche from within the library.